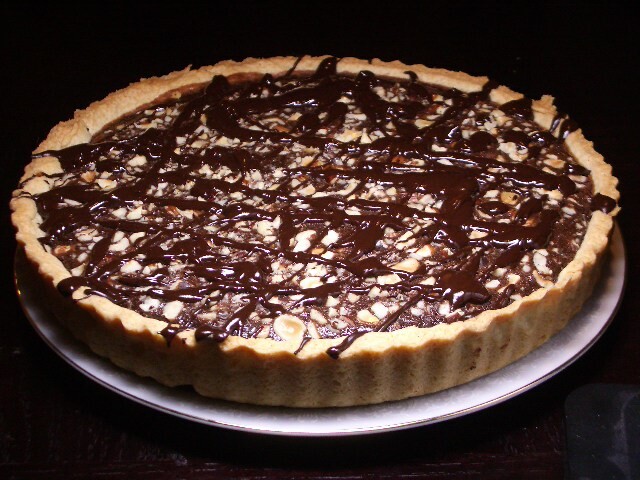 This tart is one of the first desserts that we made together as a married couple. Of course, we didn’t have a blog at the time, so the picture below is from a recent re-do. We got Nick Malgieri’s Modern Baker cookbook as a wedding present, and initially thought it was full of recipes that were too complicated for everyday life (but were happy that its bright orange dust jacket would look good on our cookbook shelf!). Slowly but surely, we’ve tried a number of recipes from the cookbook, and have never been disappointed (see Individual Cheesecakes, Quiche dough, Olive Oil Cake with Blood Oranges, Cocoa Banana Muffins, and Caramelized Onion and Gorgonzola Tart). This tart is particularly delicious – it is the perfect combination of chocolate-orange-nutty-goodness and just a hint of rum flavor. Simply put, this tart = perfection.